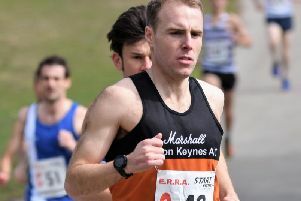 Tuttle brothers Steve and James helped Marshall Milton Keynes Athletic Club to a find 21st place finish at the National Cross Country Championships. In the huge field of more than 2,300 runners from 162 teams, James (176th) led home Steve (178th). The pair led home Paul Mizon (235th) who was making his debut, with Jonathan Peters (299th), Graham Jones (314th) and Ian Wood (328th) completed the scoring six. For good measure they had five other runners, Mark Palser (443), Tom Cuthbertson (509), Jeremy Vick (614), Steve Herring (618) and Steve Withers (1203). There were two fine top 100 placings in the ladies race over 8km. Lara Bromilow again led them home in 54th place, just five places down on her best from 2015. Rachel Robinson finished 69th, sixth best-ever by a MK athletes. Mel Wright took 446th position and then two ladies making their debuts in the event, Lilli Stickley (931) and Karen Bugai (1085) from a field of 1200. James Minter ran to the sixth best by a MK runner in the under 20 men’s 10km race finishing 41st. Devon Harford took 119th and Ewan Forsythe 166th. Finlay Gibbs was the sole under 17 but a good run in the top 100, 94th from almost 400 runners. The under 13s ran 3km and were led home by Harry Rose, 124th from nearly 600. Callum Tripp placed 179th and Oliver James 388th. In the younger girls age group races the de Koning sisters were first home for their teams, Barbara 49th in the U15s and Sonja 100th in the U13s. The former team was completed by Tia Sinclair-Linton (312) and Nicole Whittle (363). In the U13s, Morenike Orimalade was 319th and Phoebe Miller 389th.